Initially, there were rumors that The Walking Dead made some AMC executives uncomfortable, leaving them to question whether or not zombies could be sustainable. (Of course they're sustainable, they are undead.) Those rumors have reversed. After the Halloween premiere, most whispers suggest the series will earn a 13-episode second season (maybe more). And, if the first episode installment is any indication of what is to come, there is plenty of life in the unexpected adaption. The credit belongs in part to Image Comics for publishing The Walking Dead, originally created by writer Robert Kirkman, artist Tony Moore (issues 1-6 and covers), and Charlie Adlard. The rest belongs to AMC for pairing the idea with three-time Oscar nominee Frank Darabont (The Shawshank Redemption, The Green Mile), Gale Anne Hurd (The Terminator, Aliens, The Abyss), and Kirkman (of course). Together, their combined talents, and what appears to be a near perfect cast at the start, have managed to find the sweet spot for fantastical stories. It's not about zombies. It's about people, who happen to be placed in an extreme circumstances. The story is gritty, suspenseful, and unmistakably adult. 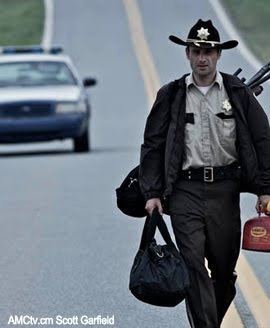 Wounded in the opening segments of the series, sheriff's Deputy Rick Grimes (Andrew Lincoln) wakes up in the hospital to a very different world than the one he left. Everyone has since evacuated, leaving the dead where they lay. He slowly makes his way home, finding his house abandoned and being unable to process the danger all around him. Fortunately, Grimes is stumbled upon by Morgan (Lennie James), a father dealing with the loss of his wife and protecting his son, Duane, in a very off-kilter world. The two have secured a nearby house, a refuge they made while evacuating the city after Morgan's wife had been infected. What works is that while the show is violent, it never beats you over the head with gore or dread. It's balanced, with enough hope and motion to carry it forward. You want to know what happens next. The only hold back in the first episode is the intense focus on Grimes, leaving us to wonder whether or not we'll feel the same about the extended cast. There is no question about Morgan. Jericho veteran James looks remarkably at home in his role. It's his second outing with AMC, lending another powerful presence in a supporting role for the mini-series The Prisoner. While Grimes provides a glimpse of a character setting his moral boundaries amidst the confusion, Morgan demonstrates the difficulty of knowing what is right without the willpower to do it. And more than anything else, this is the hook. Many people are surprised how emotional the story can be. The Walking Dead might capitalize on zombies as a backdrop, but only in that they allow for suspense, metaphor, and a canvas to vet the human experience. That is the secret to fantastic stories. They work best when they bring out humanity rather than bury it. And unless there is an unexpected departure from this general premise, I anticipate The Walking Dead will live for some time. The Walking Dead Episode 1 Rises To A 8.2 On The Liquid Hip Richter Scale. If you missed The Walking Dead because you assumed it might border on the absurd, you can still find episode one on iTunes. In addition to episode one, there are two free downloads: a motion comic and extended sneak peak. Unless you have an aversion to zombies, it's one of the best new additions to AMC. Unlike Rubicon, which finally found its momentum by episode 8, The Walking Dead delivers with episode one. The best comparison doesn't even come from the abundance of zombie movies as much as something cut from the shorts that make up World War Z: An Oral History of the Zombie War by Max Brooks, a book worthy of review some time in the future.